A.P Government has introduced Mana Vooru-Mana Badi programme today.The context of this Mana ooru-Mana Badi programme is to stop declining trend in Government schools' enrollment over the years. Otherwise, this is resulting in closing of zero enrolment schools, merging/ consolidation of non-viable schools with neighbouring schools during the rationalization process. Multi-grade teaching becomes inevitable when the enrollment does not justify the allocation of full complement of teachers.So in the above context, it is proposed to take up a special #campaign Mana Vooru - Mana Badi to complete the Admissions of 2016 academic year in all Government/ Zilla Parishad Schools from 20th April to 5th May 2016. To take up and complete admissions for the academic year 2016-17 from 25th April to 5th May 2016. Children completing 5 years of age in Anganwadi Centers. Children residing in the vicinity of Model Primary Schools. To encourage the parents to admit the school-aged children in Government school. To make aware the parents and their wards studying in private schools about the benefits being provided by the Government like good infrastructure, well-qualified teachers, free text books, free uniforms, Digital Class Rooms, quality teaching, English Medium option, etc. and to encourage them to seek admission in the Government Schools. Plan and lead on the "Mana Vooru-Bana Badi" campaign. Ensure participation of public representatives like MLAs, MLCs, ZP Chairpersons, community leaders, etc. in the formal launch of campaign. Coordinate with PO, SSA for developing and supplying of required publicity material, admit cards, registers, etc. Delineate the roles and responsibilities of Sectoral officers and CRPs of SSA in working with the field teams to mobilize parents and ensure high enrollment. Submit a compliance report to the CSE, A. P., Hyderabad. The Mandal level team should plan and lead on the Mandal and school level campaign. They should ensure that all habitations in the Mandal are covered in the campaign through participation of the local public representatives. MPDO, MEO should take up joint action along with the concerned CDPO, Supervisors of Anganwadi Centers to ensure that all children completing 5 years of age in the AWC are admitted to nearby MPP/ Government School. The CDPO, Supervisor should provide the data of all children completing 5 years to the Headmaster/Teacher of the nearby Primary Schools for taking up the admission process. The MEO should coordinate with Head Masters and School Management Committees in the Mandal to ensure the admission of school-aged children, drop out children and out of school children is done in the nearby Government Schools in the Mandal. The details of the admissions made in different schools in the mandal should be data entered on the CSE portal using the MEO login provided. Details of 5 years completed children should be obtained from the localAWCs. Similarly details of the students completing 5th class in the Primary Schools in the catchment area should be obtained. A meeting should be held with the AWW and the parents of the children completing 5 years of age. They should be made aware of the benefits of joining the children in the Govt. Schools. They must be assured that good quality education will be provided to their wards. The details of admissions made should be entered in the Admissions Register. An admission card is to be issued to all the students getting admitted to the next class clearly indicating the class in which she/he shall be admitted to for the next academic year 2016-17. The teacher should identify the catchment area around the school vicinity and ensure that maximum number of children are enrolled in the School. While making efforts for such enrolment, the HM/Teacher should enlist the support of School Management Committee Members, Local leaders, teachers and Head Masters of schools in the catchment area, NGOs, if any, working in the area, etc. After a thorough survey in the locality children studying in Government schools, children studying in Private schools. Drop out/ Out of School children should be identified and all efforts made to admit them to the next class for the academic year 2016 -17. The above details should be entered in a register to be maintained by the School Head Master and Teacher. The Chairman and Convener should arrange for holding a rally in the early hours of the day with all stake holders at school level. Banners, Placards should be displayed during the rally highlighting the benefits provided by the Government. The Brochure/ Pamphlets developed by SSA should be distributed to every parent. On the same day of rally, a school assembly should be organized with all the stake holders. The Head Master should display the details of children as entered in the register. He/ She also should discuss with all stake holders the plan and procedure to admit the children in Government School. An amount of Rs. 2500/ -to 5000/- may be utilized (commensurate with the enrolment to be made in the School) from School Management Committee funds to meet the expenditure towards conduct of rally, school assembly and various activities relating to the "Mana Vooru Mana Badi" Campaign for admissions 2016. All the teachers should participate in the program. The Hon'ble Chief Minister of Andhra Pradesh will launch the "Mana Vooru-Mana Badi" Campaign on 20.04.2016 at Kadapa at 05.00 PM. 1) For activity proposed during launch programme, all arrangements should be made to issue Admit Cards to the students identified & participating. 2) The services of One Headmaster and One Teacher from each category of School shall be utilized for the Mana Vooru-Mana Badi Campaign. An amount of Rs.250/ -per day for each Teacher and an amount of Rs.400/ -per day for each Headmaster should be paid. The expenditure should be incurred from SSA Funds at the District Level or from School Grants, where available. 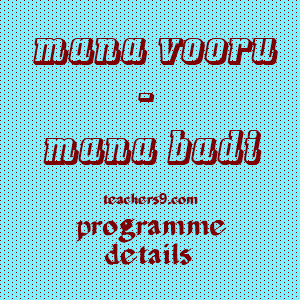 Final words: So dear friends read the above-detailed information of Mana Vooru Mana Badi programme and make grand success it.For further information, you may visit official website.